Deluxe Linen Guayabera. High Quality for Kids. 100% Linen. Long Sleeves. Back Order. White Color. Deluxe Linen Guayabera. High Quality for Kids. 100% Linen. Long Sleeves. Back Order. White Color. Back Orders or Demand. Deluxe Cotton Shirt. High Quality for Kids. 100% Cotton. Long Sleeves. Back Order. White Color. Back Orders or Demand. You're reviewing:Deluxe Linen Guayabera. High Quality for Kids. 100% Linen. Long Sleeves. Back Order. White Color. Back Orders or Demand. Drawstring Girls Linen Pants. Comfortable for Girls. Runs By Age. White. Classic Linen Pants. Comfortable for Kids. Wedding Classic Pants for Kids. Any Age. Back Orders. Linen Premium. Beige Color. Guayabera Shirt Cuban four Pockets Guayabera for kids. Short Sleeve. Run one size less than the Age. White. 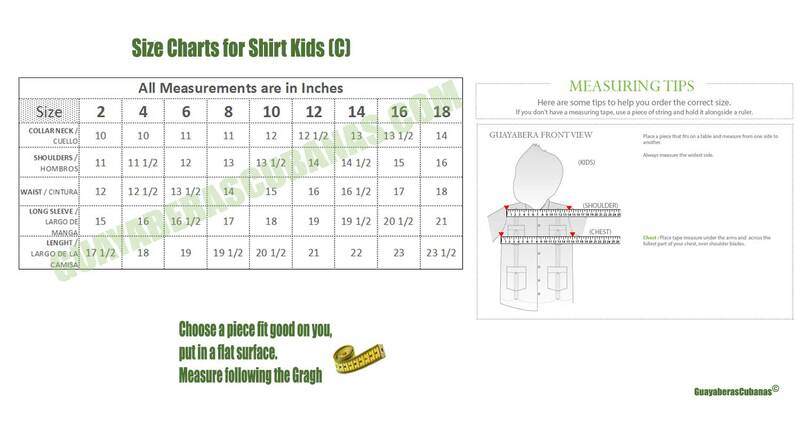 Chinese Collar Shirt for Kids. Wedding Style. Collar - MAO. Italian Premium 100 % Linen. White Color. Back Orders or Demand. Deluxe Kids Festivities Guayabera. High Quality for Kids. Linen. Finest Tuck & Embroidery. White Color. Back Orders or Demand. Presidential Guayabera Elite for Kids. Big Events, Wedding, Baptism. Unique US ! Linen Premium 1 Year to 18. Back Orders or Demand.